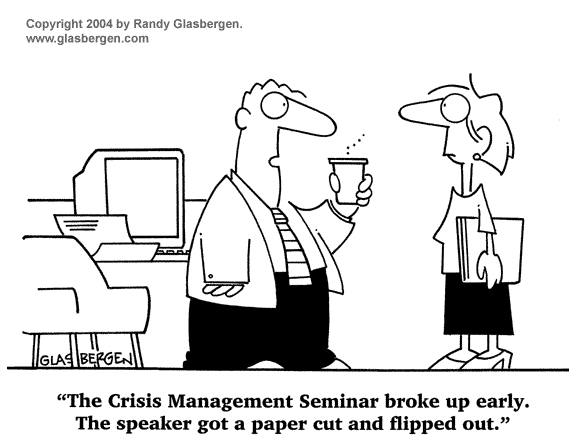 Crisis Management. This is one of those things that on one hand, I'm proud of, yet it's a hard topic to write about. For whatever reason, whether it be with my family, business, friends, non-profit or otherwise, it seems as though I've been in the right place at the right time when tough things happen. Most adversity, especially in the world of business and non-profit, is third-party induced, and oftentimes, you have NO idea what to do to calm the seas, firm up the foundation, solve the problem, communicate to the naysayers and criticism (and even the press in some situations) and begin a plan for reconciliation and a return to healthy times. Granted, I cannot put my experience with these topics into print on a website, but if you've been slapped in the face with something that seems insurmountable, call me ASAP. I guarantee you (and my past clients and places of impact with crisis management would attest) I can help you navigate through the challenge, communicate in the most difficult situations, and steer the ship back towards the course. My Kolbe A Index tells me that I am a person who naturally thinks quick, communicates well under pressure, and is an "idea factory" for solving problems. Contact me today if you need help. Call me today if its an extreme emergency. I'm usually available to be on the next plane. In fact, it just happened two weeks ago. To learn more about some of my colleagues experiences with my crisis management, please visit my LinkedIn Profile and read my recommendations.